Why are OEM CSL wheels so heavy? I absolutely love the look of CSL rims. But, for some reason BMW made the e46 CSL with carbon fiber everything and no radio and instead of putting lightweight wheels on it, they created these heavy wheels to put on it. Anyone understand why BMW decided to do this? Just doesn't make much sense. (possible complete n00b question, flame suit on). bump, someone must wonder about this too.. Doesn't make sense that BBS, Volk, OZ, etc can all make much lighter rims, yet BMW went with something that weighed a lot since we all know how important rims are as far as unsprung weight. I was thinking this too. Either durability or for the cosmetic appeal of the wheel. But brands like BBS have light, durable, and IMO beautiful rims. Are you refering to Replica CSL wheels or the Real CSL wheels? Also the wheels on the M3 Competition Package are different from the wheels that came with the CSL. They look the same but are different! the OEM CSL wheels.. I wasn't aware that the comp. pkg ones were any different though. But I'm guessing that they are both about the same weight, correct? Who produces BMWs OE wheels? They're incredibly strong. They make excellent track wheels on high-speed courses. May not be ideal for auto-x, but several M3's sport them on ring runs. 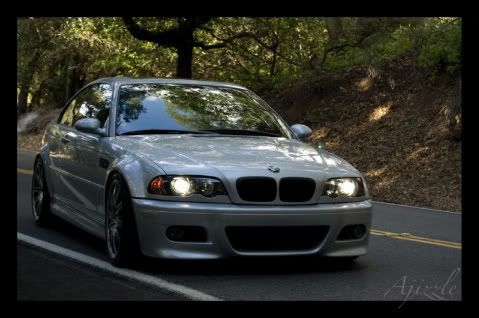 The OEM CSL wheels are made by BBS and are forged. The OEM ZCP wheels are made by BBS and are spun cast. What makes you think they are heavy? They are not heavy as you mentioned. I think the 135s are a bit heavy but the other stock wheels are quite light. Since everyone is talking about how heavy or not heavy they are... does anyone know how much they actually weigh? perhaps to lower the center of gravity...helping it stick to the track a little better. What I've read and which led me to create this thread was that the CSL rims weigh about 26 pounds.. which is not super heavy, but it could be a lot lighter. so you can see as to why they made all those light weight parts, they DID make light weight wheels for it. I just found this conflicting quote from turner motorsport's store for their OEM BMW m3 CSL wheels..
"These weigh in at only 24LBS each for the front, 25.5 for the rear!" Those arent light weight when you compare them to rims such as BBS RGR. Also the LM is a multi piece wheel.